Check Out the Latest Issue of Sundog Lit, with my artwork on the cover! Issue 5 also features fiction works by Amarie Fox, Jo Gatford, Nathan Knapp, Christina Olson, Vincent Scarpa, and Joel Smith. The issue is also particularly poetry-heavy, featuring work from Shauna Barbosa, Sara Biggs Chaney, Laura Carter, Ben Clark & Colin Winnette, Kristina Marie Darling, Darren Demaree, Shawn Fawson, Elisa Gabbert & Kathleen Rooney, B.B.P. Hosmillo, Rose Hunter, Nanette Rayman, Suzanne Richardson, Katie Schmid, Phillip Spotswood, and Anna B. Sutton. Thanks to everyone who came out to see the show! Thanks also, to Katie Morabito who curated. 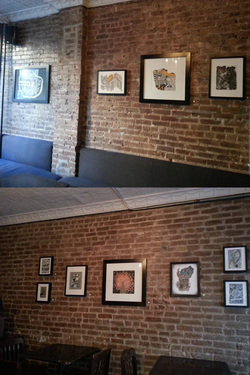 Always fun to be able to drink my favorite bourbon and look at my very own art display. Literary Manhattan has written a review of my work! Read their review here, and keep track of all their other literary goings-on, such as the cultural reviews, literary locations, and the Writer's Hotel.